My friend Shelly, who I’ve mentioned on here before, is going on a 3 week vacation with her family (jealous, right?) & loaded me up with another bag of gorgeous fresh summer veggies from her garden! She didn’t want her ripe beauties to go to waste & knew that I would make good use of them! So when I unloaded the generous bag full of eggplant, peppers, tomatoes, basil & the largest zucchini I’ve ever seen, a “Summer Vegetable Ratatouille” came to mind! 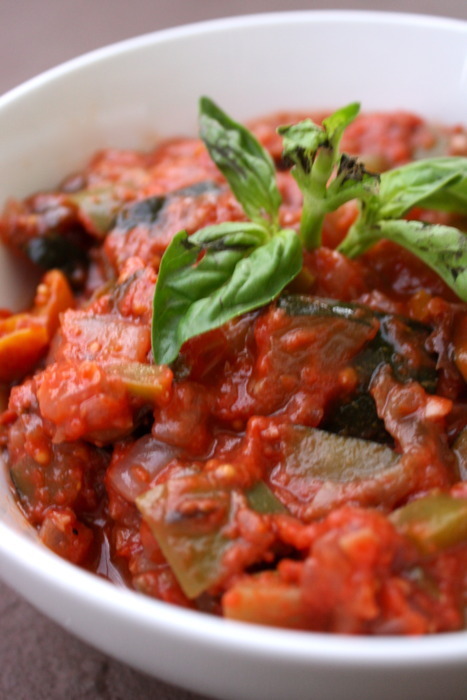 I’ve made different versions of ratatouille in the past, but needed one I could modify to meet the ingredients I had on hand. I found this recipe & went to work on my own custom version! Add onions & garlic, stirring well. Cook until onion is soft & translucent, about 4 minutes. Dice the vegetables into 1-inch pieces, keeping them of similar size to ensure even cooking. Add eggplant, zucchini & pepper. Stir & cook for about 5 minutes. Add tomatoes puree, cherry tomatoes & herbs. Season with salt & pepper. Stir well & turn down heat to low. Cook, covered for about 45 minutes or until vegetables are tender. Serve over rice, pasta, or on its own with crusty French bread & top with vegan Parmesan. 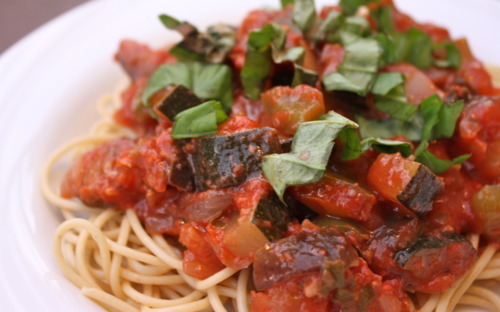 I love to enjoy ratatouille a number of different ways, but on this particular night I served over multi-grain pasta & added a chiffonade of fresh basil! Good stuff! Thanks Shelly & Jose! Love you more than basil martinis!!! Enjoy your vacation! « Risotto Portobello, Vegan Wine & More!